1.) It’s National Chili Month. Celebrate! 2.) The colors! Could there be a more perfect Halloween meal? 3.) It’s a perfect veggie-centric (vegan!) way to switch up your chili routine. Variety is good! I could go on, but I thought a top 10 list might be a little obnoxious. Really, though, this sweet potato and black bean chili is pretty amazing. The flavors are bold and assertive. Nobody will go around calling this healthy chili bland. I used ancho chili powder, which is made from the pablano chili pepper. Pablano peppers can range from mild to medium-hot, but the ancho chili powder gives this dish some heat. If you don’t want the spice, use regular chili powder. If you want the heat, but don’t have ancho chili powder, use regular chili powder and add a little cayenne pepper instead. I’m in love with this sweet potato and black bean chili because of its bold flavor, but I can’t ignore that it’s also a super easy recipe. The hardest thing you have to do is chop an onion and some sweet potatoes. You can handle that, right? I think you’re going to love this chili, so I hope you give it a try! 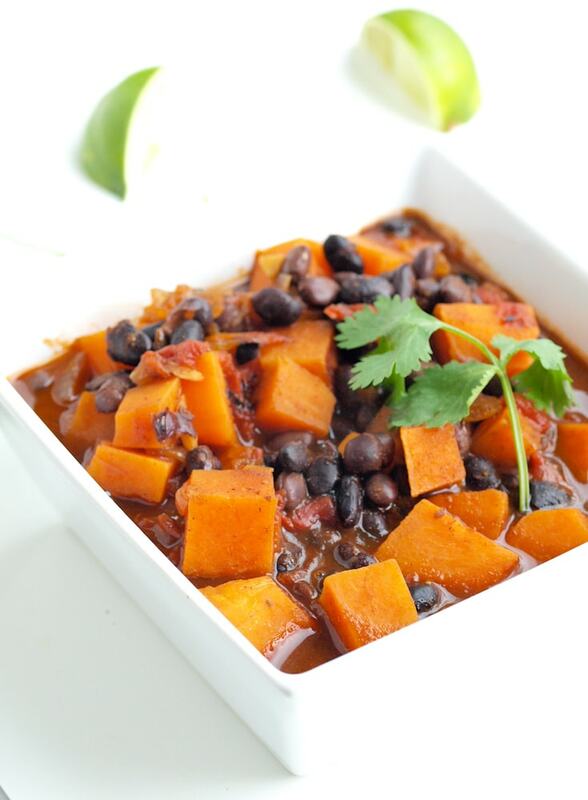 This healthy Sweet Potato Black Bean Chili is full of flavor, easy to make, and always a hit. Add the onion and cook until softened and lightly browned, about 5-7 minutes. Add the garlic and cook one more minutes. Next, add the sweet potato, chili powder, cumin, salt, pepper, smoked paprika, and cinnamon. Stir until the sweet potatoes are coated with the spices. Next, add the diced fire-roasted tomatoes, 3 cups of the stock, and the tomato paste. Bring it to a boil, and then reduce the heat and allow the mixture to simmer until the potatoes are soft, about 30 minutes. Stir in the black beans and cook until they are warmed, a few minutes more. Serve with fresh cilantro and lime wedges. 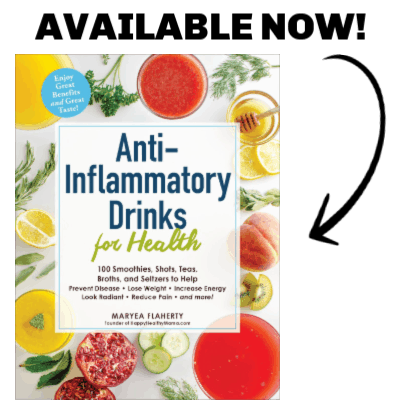 <—–Although optional, I highly recommend using the cilantro and lime! The cilantro and lime juice compliments and balances the flavors nicely. Enjoy! Find this and more soup recipes on Sunday Night Soup! This looks great! I’ve been stockpiling chili recipes all month. The perfect comfort meal for this time of year, love this! I have a recipe similar to this on my blog and it’s deeelish! I love sweet potato black bean chili’s. Such a great vegetarian option for chili. I waited way too long to try something like this. I love it! I love the idea of using something like this for Halloween! What a fun, out-of-the-box suggestion. Yum! 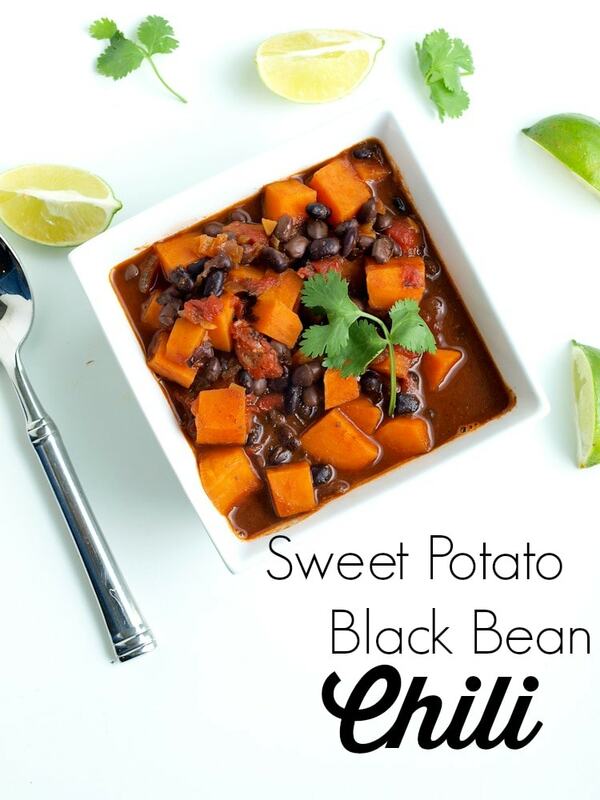 I’ve been craving a veggie chili lately, and I’ve never thought to put sweet potato in it! I guess I’ll have to start celebrating National Chili Month ASAP! Received this in my email today, made it for dinner tonight. Love love love. It’s really good. Plan to put this into my rotation for winter!!! Beans and sweet potatoes is one of my fave flavor combinations! Such perfect for fall! Let me know what you think, Lindsay! What a delicious looking Chili! Loving the sweet potato and black bean combination. Definitely a recipe I can see myself creating! LOVE this one! My hubby the meat eater even loved it and suggested I take it to our work cook-off and to our lifegroup. Everyone there loved it too! Is this a recipe that can be made ahead and frozen? Don’t know how the beans and sweet potatoes would hold up. Thanks! Yes I have actually tried freezing this and it works well! Made this tonight and it was a winner! Oh and kid-approved…my 3 year old daughter actually said she was going to sneak out in the middle of the night and eat more! Also love that it made enough for leftovers. We topped ours with diced avocado.